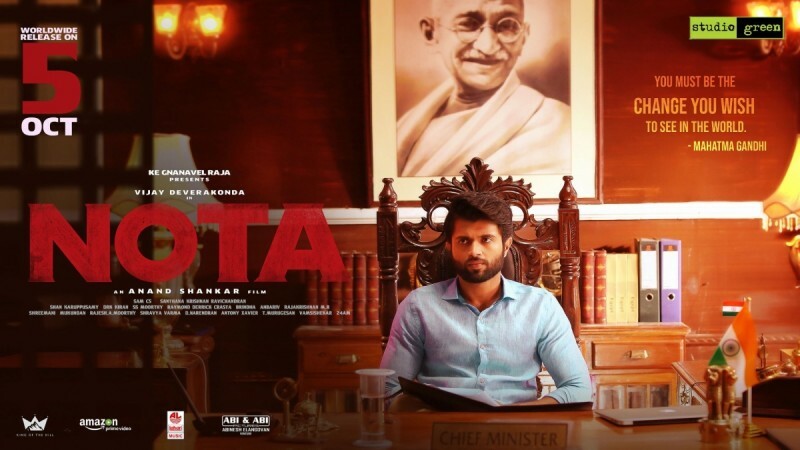 Vijay Devarakonda's NOTA has collected Rs 25.50 crore gross at the worldwide box office on the first weekend and earned Rs 11.50 crore for producer KE Gnanavel Raja and other distributors in 3 days. Vijay Devarakonda's NOTA opened to superb response, but went to make an average collection at the worldwide box office in the first weekend. It has failed to live up to the expectations of its makers. Vijay Devarakonda was riding high on back-to-back blockbusters like Arjun Reddy and Geeta Govindam. Their huge success had increased the viewers' curiosity sky high and several distributors were ready to shell sums on its theatrical rights to cash in on the craze especially in the Telugu states. But producer KE Gnanavel Raja, the owner of Studio Green, decided to release the film almost everywhere on his own. Riding on the huge hype, NOTA started with a bang and collected Rs 14 crore gross at the worldwide box office on the first day and earned Rs 7.35 crore for its makers. Considering the hysteria, the bilingual movie was expected to beat Vijay Devarakonda's recent release Geeta Govindam, which minted Rs 16.40 crore gross in the global market on its opening day, but it failed to do so. NOTA failed to impress many viewers and word of mouth took a toll on its collection on the following days. The movie witnessed a steep decline over the weekend. The film has reportedly collected Rs 11.10 crore in the Telugu states, Rs 4.50 crore in Tamil Nadu, Rs 5.15 crore in Karnataka, Rs 1.70 crore in other parts of India and Rs 2.45 crore in the US in three days. NOTA has reportedly collected Rs 25.50 crore gross at the worldwide box office on the first weekend and earned Rs 11.50 crore for its distributors. The movie is likely to be a flop as it will clash with Jr NTR's Aravinda Sametha starting this Friday. KE Gnanavel Raja has failed to cash in on the popularity of young sensation Vijay Devarakonda, who has suffered a huge setback due to the producer's poor planning. It is reported that KE Gnanavel Raja, who shelled out Rs 12 crore on NOTA, had got an offer of Rs 18 crore from Telugu film distributors. But the producer preferred to release the film on his own with the support of Sunil Narang and UV Creations. His game plan went wrong and ended up incurring losses for now. "Gnanavel got offers from Telugu film distributors to the tune of Rs 18 crore including Rs 12 crore for Andhra region, Rs 4 crore for the Nizam region and Rs 2 crore from the Ceded region. He could have walked laughing all the way to the bank since he made the film with a budget of just Rs 12 crore," Hans India quoted distributor Vishweshwar Rao as saying. "After bearing all the expenses like fee for digital screenings, rentals and on publicity, he could make a maximum amount of only Rs four crore as the film tanked at the box-office in the two Telugu states after a decent first day collection. Now with the NTR film set to release on October 11, it will be difficult to pick up," added Vishweshwar Rao.